Pseudo Parkinsonism also known as false Parkinsonism or drug induced Parkinsonism. The term pseudo Parkinsonism has been used very little in the recent literature. Pseudo parkinsonism and parkinson disease can be the etiology of parkinsonism. The Parkinson disease and pseudo Parkinsonism is difficult to differentiate because their clinical features resemble each other. Basically it is a drug induced disease caused by neuroleptic antipsychotic medications. The dopamine receptor antagonist properties of these drugs induce a clinical syndrome named pseudo Parkinsonism that resembles Parkinson disease. The pseudo Parkinsonism consist of hypomimia, hypophonia, down b.p, tremor at resting position, rigidity, bradykinesia, shuffling and inappropriate posture. The term pseudo is used or false to differentiate it from other neurodegenerative diseases. Apraxic slowness, paratonic rigidity and frontal gait disorder are the signs which are reaponsible for the pseudo parkinsonism and also these signs differentiate it from parkinsonism. In pseudo Parkinsonism apraxic is the condition in which the patient is not able to perform a task or slowness ( because cognitive processing is slow) in performing some actions such as dressing, eating or walking. Apraxia happens when there is disturbance in the cortical function and can cause akinesia, hypokinesia and bradykinesia as it resembles Parkinsonism. About 80% of patients taking typical antipsychotic drugs exhibit pseudo Parkinsonism. 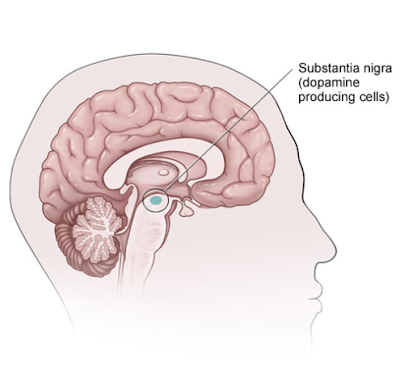 Dopamine receptors are widely distributed in the brain and typical antipsychotics may act on dopamine receptors in the striatum. Therefore all patients taking anti psychotics may have some risk of developing drug induced Parkinsonism. Clozapine has been associated with a granulocytes in about 1% of patients. Other drugs have minimal risk of the drug induced Parkinsonism. Drug induced Parkinsonism is more common in females whereas males are more susceptible to Parkinson disease. Whereas symptoms persists or the same duration in both diseases. Neurological deficits are more severe in drug induced Parkinsonism orolingual dyskinesia in drug induced Parkinsonism patients is rare. Drug induced Parkinsonism shows extrapyramidal symptoms. Extra pyramidal symptoms may be acute and tardive. Since it is difficult to measure extrapyramidal symptoms, rating scales are commonly used. Anticholinergic drugs are used to control the antipsychotic drugs induced extra pyramidal symptoms. Although akathisia may require beta blockers or even benzodiazepines for treatment. If the extrapyramidal symptoms are induced by antipsychotic drugs then extrapyramidal symptoms can be reduced by the use of atypical antipsychotics or dose titration. The atypical antipsychotics used may include clozapine, Risperidone, olanzapine, Quetiapine, ziprasidone and aripiprazole. Commonly used medications for extrapyramidal symptoms are anti-cholinergic agents such as benztropine, trihexyphenidyl, diphenhydramine, dopamine agonists are also used such as pramipexole. These medications reverse the symptoms of extra pyramidal symptoms caused by antipsychotics or other drugs.